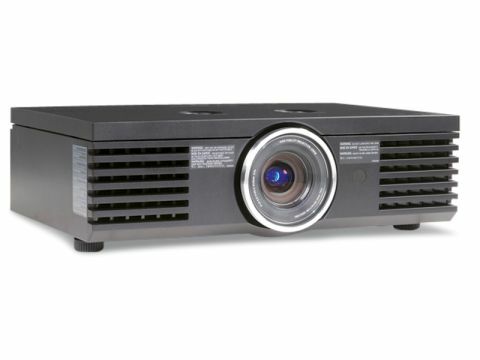 Panasonic's PT-AE4000 looks like the same big, grey shoebox the brand has been touting as a projector for the last three years. Indeed, there's no visible difference between this and the outgoing PT-AE3000, but for good reason – it's a shoebox with a remarkably successful lineage and exquisite picture quality. While the unapologetically dull and corporate casing remains the same, inside you'll find a new kind of lamp that promises better colour and contrast, and more of the picture enhancing features that have made this series of projectors a favourite among home cinema enthusiasts. Panasonic says it's aiming at the 'prosumer' with this model. That basically equates to an uncompromisingly specified Full HD PJ with the functional styling of studio equipment, but with a user-friendly interface, Viera Link control and an image that's best suited to a large living room. It builds on everything we loved about the AE3000 – flexible lens-shift options, filmic 1080p picture quality and easy 2.35:1 screen ratio – and adds a new red-rich lamp and an improved dynamic iris. In fact, this PJ now packs more picture-enhancing tech and bonus features than any I've seen so far. As you'd expect from its moniker, the red-rich lamp in this unit produces a slightly warmer colour tone than is traditionally delivered by LCD-based projectors. It's not just the red that's improved though; with a decent Blu-ray transfer like The Day After Tomorrow, the colours struck me as more lush and lifelike across the spectrum. Panasonic's projectors haven't been the brightest in the past, but this is where the new lamp again has an impact. Select one of the three Cinema preset modes and the general brightness level is still very low, but in Normal and Dynamic modes the extra punch makes the image appreciably lighter than its predecessor, and more suitable for viewing in fairly well-lit conditions. In fact, it's in Dynamic mode that the Panasonic delivered its best contrast measurement in our Tech Labs, an eye-opening 95,056:1. However, I wouldn't advise you use this mode for movie playback – it's simply too bright, and will most likely lessen the life expectancy of your lamp (and probably your eyeballs). The PT-AE4000 sports the latest iteration of Panasonic's Frame Creation technology, which inserts frames to make motion smoother. It's enough to prevent the judder that can accompany the camera pan in the opening sequence of TDAT when less-efficient processors are used, but I have reservations about high frame-rate movie playback. The projector offers a sliding scale of acceleration, and when first presented to HCC, Panasonic enthusiastically demonstrated the feature. But while it makes images super smooth, it has a disastrous effect on movies, removing all sense of cinematic tone and flow. It works well for Sky Sports HD playback, but otherwise I'd advise caution. With Panasonic's NeoPDP plasma panels ripping up a storm in terms of black levels, it's no surprise to also find its premium projector doing a decent job in this regard. However, it's an area where Sony and JVC, with their LCoS-based PJs, are arguably stronger. In terms of contrast, particularly resolving the detail in very dark scenes, there's some room for improvement. And conversely, TDAT's garish scenes set in the Antarctic look impressively white, but lacking a little in detail. The sheer flexibility of the PTAE4000 is astonishing, with all manner of setup options and helpful calibration tools. For starters, it has an extremely wide zoom and optical lens shift range. This means it'll fill a screen of up to five metres from the middle or back of the room, with plenty of scope to adjust the image without ever needing to resort to digital keystone correction. It's all motorised, too, so you can do all this, and even focus, from your armchair. Additionally, Panasonic has finally decided to fit two 12V triggers to its flagship home cinema projector, making it – at last – a model we can recommend to someone wanting to integrate it with an electric screen. For those with a variable aspect ratio 16:9/21:9 screen, the PJ also as a Cinemascope 2.35:1 zoom mode. This means you can optimise a wider aspect ratio and commit it to memory. The projector will zoom the image to fit the larger screen area, although this also means the black bar area is projected above and below the screen. If you were thinking of buying a projector and adding an anamorphic lens, this solution could save you a lot of expense. A 1080p24 feed from a Blu-ray player yields the best results, with a beautifully filmic and detailed image. Panasonic's Smooth Screen Filter technology essentially smoothes out visible pixel structure, but manages to avoid any kind of soft focus. Unsurprisingly, DVD doesn't fare so well when blown up to fill a six-foot display, but the video upconversion here is reasonably good. Despite the industrial-looking design, this is a very consumer friendly projector, with three HDMI ports and a quiet fan that leaks just a little noise and light from the front. Its flat shape means that it has quite a low profile when ceiling-mounted, and, of course, the matt black finish makes it all but disappear in a dark room. It also has a simple-to-use interface. The PT-AE4000's bundled remote is tiny, but it's backlit and can still use Viera Link to locate, for example, the SD card loaded in a connected Panasonic Blu-ray player. One unique feature of Panasonic's home cinema PJs that never fails to impress is the fascinating waveform monitor that can be superimposed on the screen at any time. By analysing the light and dark parts of the screen, it can draw detailed plots of various aspects of the image, which can be useful for making very fine adjustments to colour temperature, colour saturation, brightness, contrast or gamma. There's also a more basic split-screen feature, and this is probably what you'll use more often, as it provides a side-by-side comparison of the original image and your tweaked version. I've been impressed by each version of Panasonic's 'prosumer' projectors and this latest is no disappointment. It's actually a very small step forwards, with the rich-red lamp being the standout new feature – it brings genuine improvements in colour and luminance. It's also one of the most flexible projectors in terms of installation and carries more useful features than anything I've seen at this price point.